Ju-Jitsu school van Venrooy is aangesloten bij Seishinkai Ju-Jitsu International. Het jeugd lidmaatschap is € 20,= per jaar. Bovendien krijg je korting (op vertoon van je SJJI Passpoort) bij de meeste (nationale) stages. Soke, President of Shito Ryu Seishinkai Karate-Do Union (SKU). Governor of World Karate Promotion Foundation. President of ALL JAPAN JU-JITSU FEDERATION. Head Shihan of International Budo Academy. General Manager of IBSSA (Intern. Bodyguard & Security Service Association) East Asia. Director of Osaka Prefecture Karate Federation. 1950 – Begonnen met Karate Do in Goju-Ryu en Shito-Ryu. 1954 – Enter to Shito -Ryu Karate-Club in Kansai University in Osaka Japan (Train under the instruction Soke Kenwa Mabuni). 1956 – Shihan of Seishinkai Honbu Dojo and taught Shito-Ryo to Soke Tatsuno in this Dojo when he was 15 years old. 1957 – The 1st President of Kansai Student Karate-Do Federation. 1957 – Vice Chairman of All Japan Student Karate-Do Federation - Shihan Dai of Seishinkai Karate-Do Union. 1959 – Graduated Kansai University. 1969 – Director of Japan Karate Federation. 1974 – President of Alumni Karate Club of Kansai University. 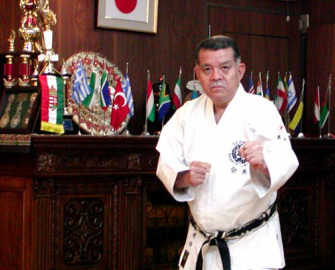 1997 – Supreme Advisor of Seishinkai Karate-Do Union. 1999 – Decease of Soke Tatsuno. 2000 – Succeeded Soke title.